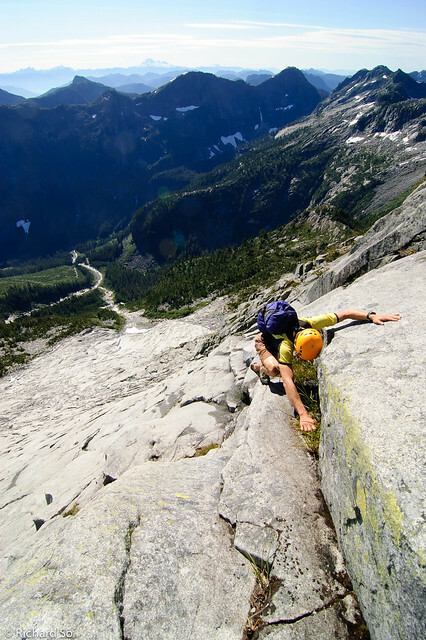 Back in September, Chris Tim and I scrambled up the amazing Southeast Face of Stonerabbit Peak. 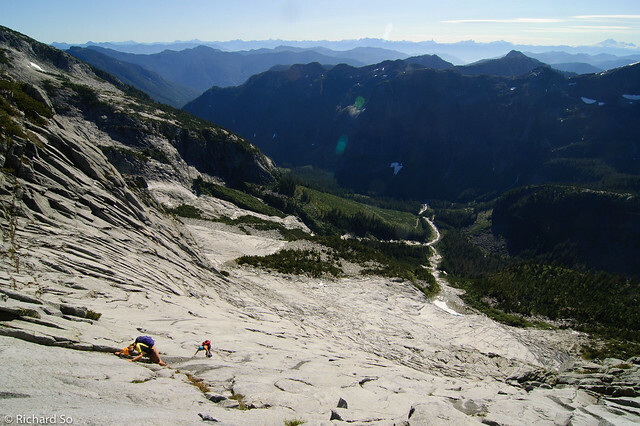 The route climbs 900m of coastal granite goodness, with minimum bushwacking, a rarity in this part of the world. 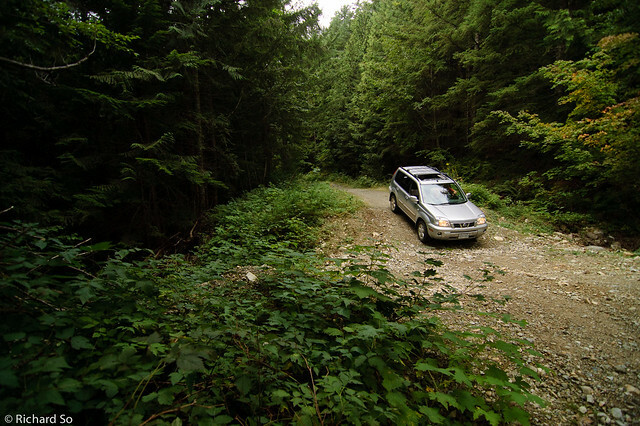 We drove along the Chehalis Main line for 30km, all 2wd, and then turned off onto the Skwellepil Creek road. This spur road quickly turns into a water bar nightmare. With Chris's X-trail, we were able to bash our way up another 4km along the road with the highest density waterbars that I've seen. I'd recommend just taking a bike for this section. From where we parked (the road is washed out beyond), we hiked for another 4-5km to the end of the road. This happens to be the view from the end of the road. The red line shows our approximate route on the face. We scrambled up on both sides of the creek, entering the bush when necessary to avoid wet boulder problems on the waterworn slabs. Chris venturing into the bush on our approach. This is approximately half way up the creek. Going down was much easier as we could just lower ourself off branches and shrubs. 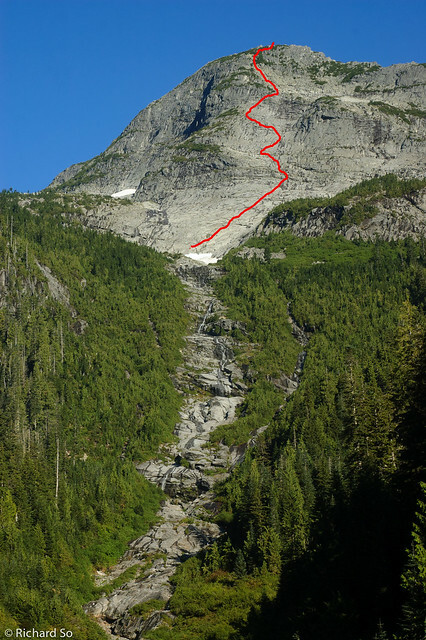 Once we reached the base of the southeast face, we put on our rock shoes and started up the calf-burning lower angle slabs on the lower face. I was pretty happy that the rock looked dry. It had rained the previous morning, but the afternoon sun must have been enough to dry it out. The route finding is fairly straightforward on the lower half of the face. 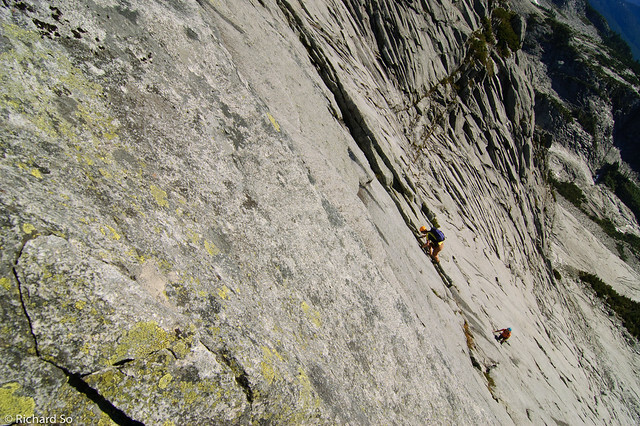 The friendly angle and sticky rubber opens up numerous route choices on this wide open granite canvas. Chris getting a full calf workout on the beautiful slabs. 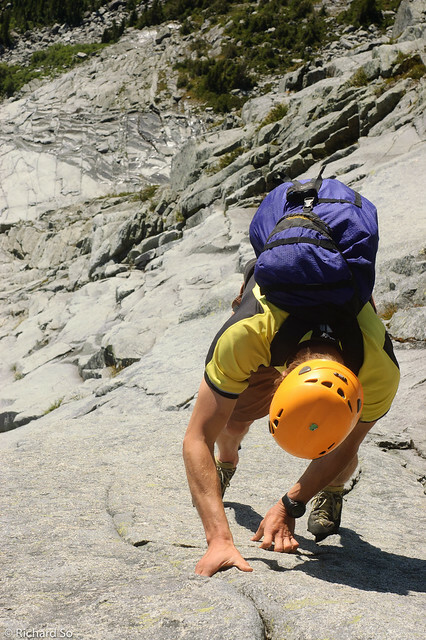 The route is generally considered as solid and sustained 3rd and 4th class. 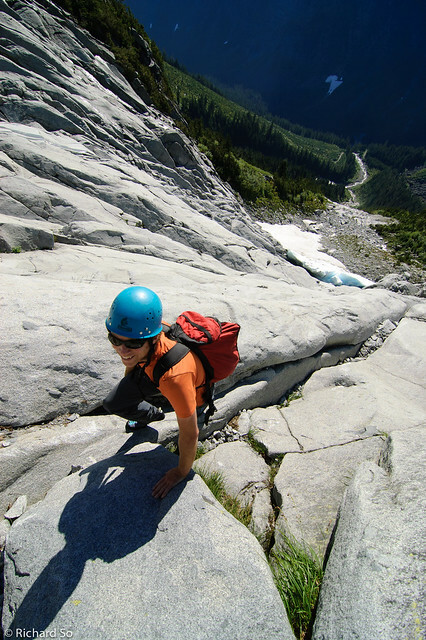 With such a wide face, it's fairly easy to venture into more difficult terrain. 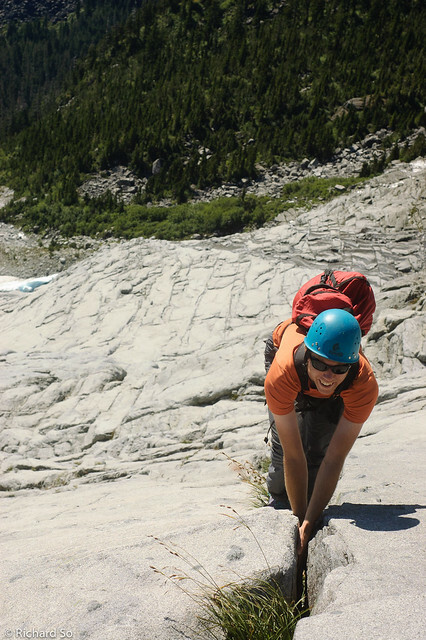 A rope could possibly be used at the crux, however it would mostly be a body belay as the rock is generally compact and featureless, with the exception of this crack that Tim found. 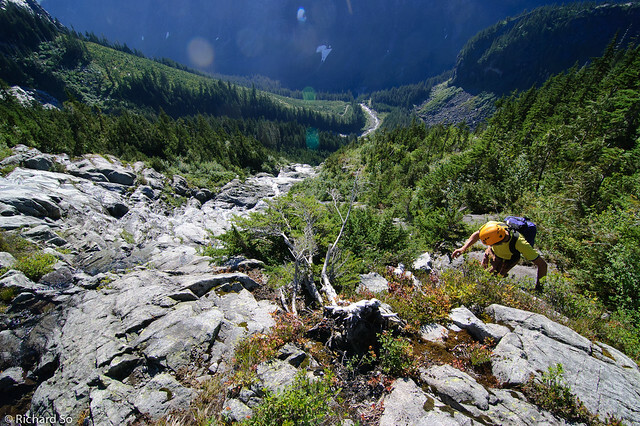 Sunny slab scrambling in the Chehalis with an awesome view. Chris and Tim climbed further to the right than I did. 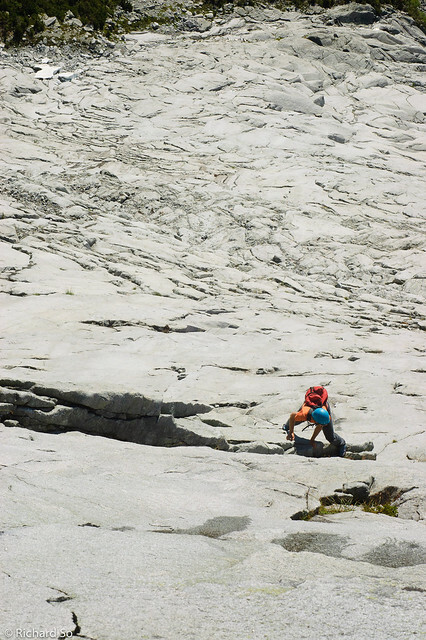 From Chris's position, he traversed along an exposed fault feature back over to where I was. I felt the route finding through this section was the most challenging, with a high potential to venture into more difficult slabs. After a little bit of humming and hawing, I decided that this feature looked like the best way up. I think it was possible to head more to climber's left to gain a more bushy indistinct ridge, but this looked more aesthetic. Chris making a delicate move on the crux slab. Fortunately he didn't have to change his underwear after this one. It's a long ways down from here. 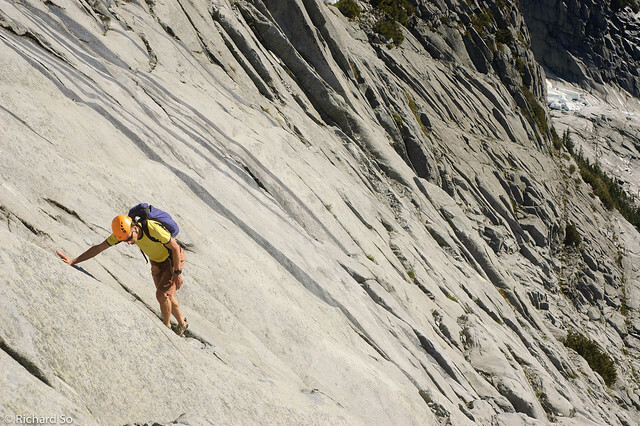 It would probably be possible to set up a body belay above here to guide up an less comfortable climber. 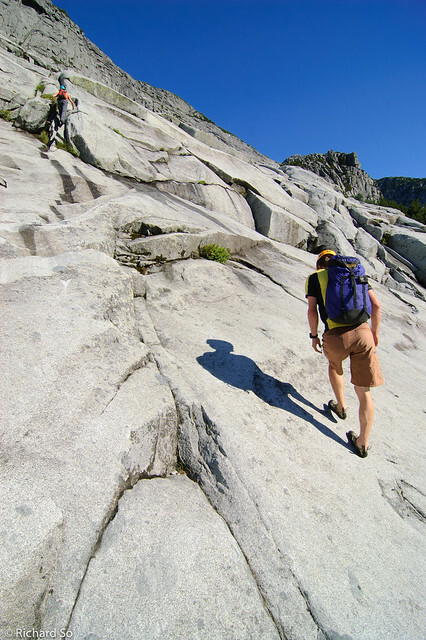 Meanwhile, Tim was still lost in the sea of granite below, trying to figure out the best way to reach our position. Tim making the delicate slab moves on the crux. Both Chris and I were a little nervous watching Tim make this move. After this trip, Tim has been more inspired to go climbing. He even made a recent purchase of a shiny new harness, and two camalots to compliment his ancient rack of tricams, hexes and nuts. The rest of the scrambling was straightforward above here to the summit. 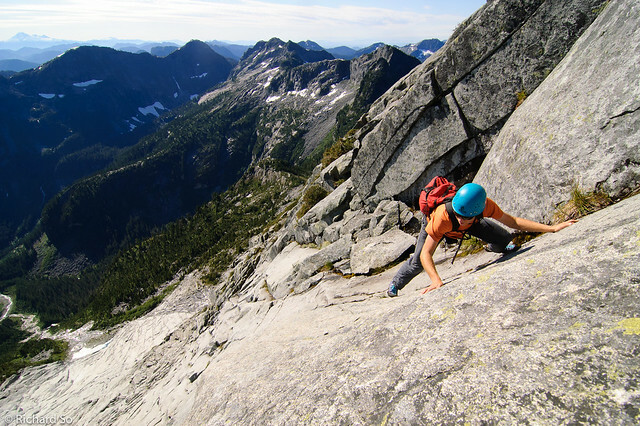 We descended the west ridge, mostly bushy scrambling without any need for a rappel and then contoured back to the base of the southeast face to descend the creek. 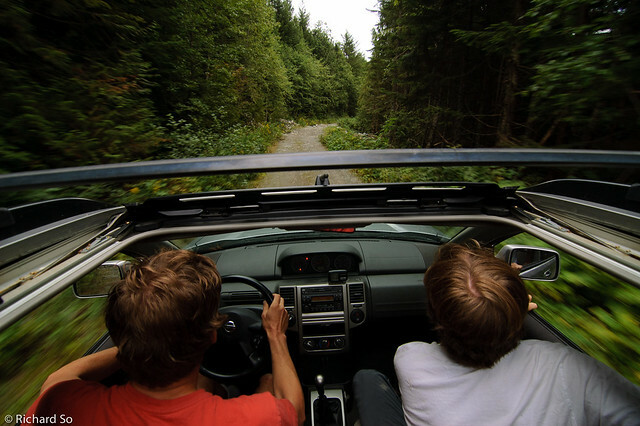 This photo gives an illusion of some high speed driving on the Skwellepil Creek road. This is actually just a brief moment when Chris could accelerate between the closely-spaced waterbars. Out of the three of us, I think Chris was the most annoyed by how slow progress on the road was. He was able to vent some of this frustration by driving faster than normal on the way home. Not quite enough clearance. 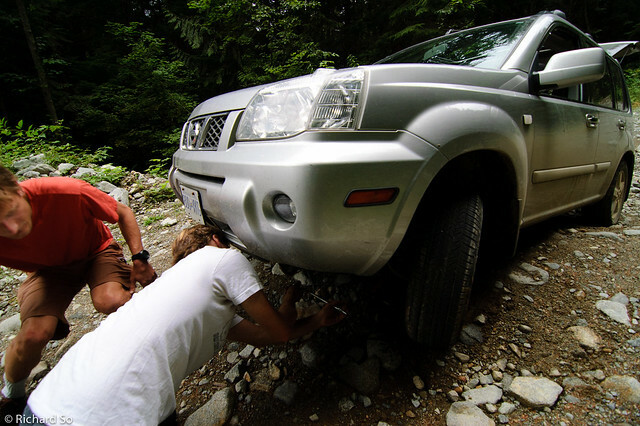 We spent another thirty minutes jacking up the car and removing the soil from beneath the frame. This ended up being an awesome day in the mountain, although it started off with some uncertainty on how far we could get up the road, and whether the face was dry or not.